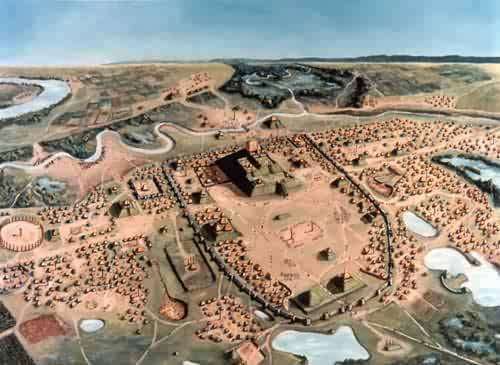 Cahokia, an Amerindian town on the Mississippi of 10,000 to 20,000 people. A forerunner of what might have been? Native Indian societies are widely seen as unchanging before Europeans came into the picture. This view sometimes has almost religious overtones. Amerindians lived in harmony with their world, and this harmony was broken by the White man. Yet this view is at odds with a growing consensus among archeologists. Rapid cultural evolution was already under way in eastern and central North America when the first Europeans arrived. 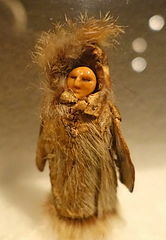 Had their arrival been postponed long enough, they would have encountered millions of sedentary Indians in a zone stretching from the lower Mississippi to southern Ontario. A northern Aztec Empire. The northern end of this zone experienced the most rapid change. Nomadic hunter-gatherers roamed over southern Ontario and New York State until late in prehistory. Then, some time after 500 AD, these Iroquoian-speaking peoples began to settle into villages and cultivate corn, beans, and squash. This cultural evolution was actually accelerating when the Europeans arrived. What if their arrival had been postponed? The Iroquois would have certainly surpassed the mound builders of the Mississippi valley and probably reached a level of civilization like that of the Aztecs. Such a scenario almost did happen. Indeed, conditions were far from ideal when the English and the French began to settle North America. Western Europe was just returning to the population levels that had existed before the Black Death. The North Atlantic was entering a cold period, called “The Little Ice Age,” that made trans-oceanic crossings difficult. Finally, the Turks were pushing deep into Central Europe, laying siege to Vienna in 1529 and 1683 and vowing to drive on to Cologne. Had this fragile context taken a turn for the worse, there might have been insufficient will or ability to colonize the Americas. European settlers would have perhaps arrived on the Eastern Seaboard only in the late 1700s. Trigger, B.G. (1986). Natives and Newcomers: Canada's "Heroic Age" Reconsidered, Montreal: McGill-Queen's University Press. Pre-Columbian copper artifacts from Illinois, Oklahoma, Missouri, and Illinois. In my last post, I criticized Jared Diamond’s theory about continent orientation and cultural evolution. This theory posits that people, and hence ideas, are likelier to circulate along an east-west axis than along a north-south one. This is because people tend to move about in environments that have similar climates and ecosystems. Eurasia has thus reaped the benefits of having a belt of societies—stretching from Spain to Japan—that can borrow new ideas from each other with relative ease. This is not the case with sub-Saharan Africa, which is oriented north-south. It has a much more limited pool of ideas to draw upon. Diamond argues that this is one big reason why sub-Saharan Africans failed to develop beyond the stage of simple agricultural societies. But what about the Americas? Aren’t they even more north-south oriented? How, then, did advanced civilizations develop in Mesoamerica and the Andes? And why did they develop even faster than ancient civilizations in Eurasia? These were the questions I raised in my last post. Here, I’ll argue that this fast pace of cultural evolution was not limited to Mesoamerica and the Andes. Take the transition from hunting and gathering to agriculture. Around 100 BC, agriculture was still confined to the American southwest. The rest of the present-day United States was home to nomadic hunter-gatherers. By 800 AD, agriculture had spread throughout most of the central and eastern U.S. and into southern Ontario. By 1000, the Mississippi valley had urban centers that were each built around a central plaza with earthen temple mounds. These developments were accompanied by a suite of cultural innovations: skilled metalworking; food storage in pits and cribs; timber palisades and bastions; and formation of intertribal confederacies. This pace of change was, if anything, faster than comparable change elsewhere in the world. There is little evidence that the availability of new ideas was a significant brake on cultural evolution in the Americas—at least no more so than in Eurasia, where new ideas were supposedly more available. Agriculture, for instance, took more than five thousand years to spread from the Middle East to northern Europe. Indeed, there is evidence of ancestral Amerindians having access to useful ideas that they nonetheless chose not to use. The wheel, for instance, was known to the Aztecs, who used it for toys. But they never used it for anything else. Another example is copper working. This metal had been worked in eastern North America since at least 5,000 BC, and the resulting artifacts were “far larger and better shaped than any known native copper objects from the Middle East” (Smith, 1968, p. 242). Yet there was never any melting, smelting, casting, or alloying of copper. In particular, there was no attempt to harden copper by combining it with tin, lead, antimony, or arsenic, although such elements were available in the Americas. Such possibilities were there for the taking, but there was apparently little interest in doing so. One factor may have been the overwhelming use of copper for status or ritual purposes, i.e., ornamentation that did not require hard metals (Ehrhardt, 2009). While such purposes certainly prevailed in Old World civilizations, the latter also used metalworking to make functional objects like kitchenware and tableware. Perhaps New World civilizations suffered not from a lack of ideas but rather from limits on the use of ideas. Mental innovation was subordinated to the interests of the ruling caste. The needs of ordinary folk came a distant second. Thus, the availability of new ideas is not the main brake on cultural evolution. What matters more is the perceived usefulness of those ideas, and the people who decide which ones are useful and which are not. Why did cultural evolution follow a more fruitful path in the Americas than in sub-Saharan Africa? The latter had more opportunities for east-west exchange, being next to Eurasia and its cultural innovations. According to Diamond’s theory, cultural evolution should have been faster in sub-Saharan Africa than in the Americas. Yet the reverse happened. How come? The main reason was that Amerindian men and women had to plan over a predictable yearly cycle. The men also had to provide for their mates and children, especially in winter—an obligation that not only integrated father, mother, and children into a single unit of family production but also freed the mother to specialize in other tasks, like garment making, food processing, and home building. These factors pre-adapted Amerindians for later cultural evolution. The “family workshop” of nomadic hunter-gatherers became a model for the economic and political structures of sedentary farmers. Diamond, J. (1997). Guns, Germs and Steel: The Fates of Human Societies, New York: W.W. Norton. Ehrhardt, K.L. (2009). 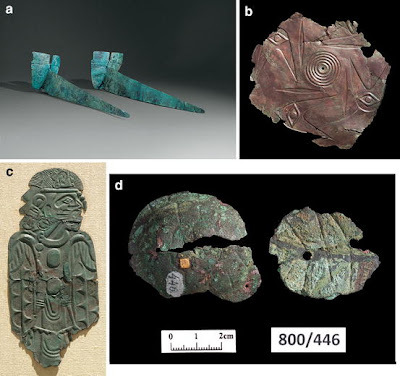 Copper Working Technologies, Contexts of Use, and Social Complexity in the Eastern Woodlands of Native North America, Journal of World Prehistory, 22, 213-235. Smith, C. S. (1968). Metallographic study of early artifacts made from native copper (pp. 237–252). Warsaw: Actes du XIe Congrès International d’Histoire des Sciences VI. The above poem, by Belgian singer Julos Beaucarne, has been making the rounds of late-night radio and Facebook pages for the past few years. Its message? Without the contributions of other cultures, we’d be less advanced, less refined, and less well off. In short, we’d be nobodies. We have met the Others, and they are us. This is Big Other at its finest. If poetry leaves you cold, a more intellectual version is available in the pages of Guns, Germs and Steel: The Fates of Human Societies by Jared Diamond. Diamond starts off by noting that people, and hence ideas, are more likely to circulate between regions that are ecologically and climatically similar. Hence, the circulation of ideas tends to be much more east-west than north-south. If we look at a world map, we see that Eurasia is oriented east-west and Africa north-south. Eurasians have thus benefited from a greater number of cultural innovations because they can tap into a belt of human creativity stretching from Gibraltar to Tokyo. Africans, by contrast, have not had this advantage. This, argues Diamond, is one big reason why Africa fell behind Eurasia in the race for global dominance. Absent from this argument is any mention of the Americas. Those continents likewise follow a north-south axis, even more so than Africa. Yet they became home to advanced civilizations in Mesoamerica and the Andes. There is some evidence that the Incas had cultural contacts with Polynesian seafarers. Other than that, both of these civilizations had to develop on their own. Did they develop more slowly than Eurasian civilizations? Apparently not. Mesoamerican civilizations reached milestones in cultural development at a faster rate than did civilizations in the Middle East. The Zapotecs developed calendar and writing systems barely 1,000 years after their first permanent farming villages. In the Middle East, the time span was over 5,000 years. Jared Diamond, like Julos Beaucarne, is begging the question. Yes, as Eurasian cultures came more into contact with each other, they each had fewer innovations of local origin and more of foreign origin. But would these cultures have been worse off if forced to innovate on their own? Indeed, an argument can be made that exposure to the “Other” tends to stifle local creativity. During the thirty years after the Second World War, Americans lived under a regime of semi-autarky, producing most of their own goods, educating most of their own talent, and generating most of their own inventions. This was nonetheless a period of almost frenetic cultural and economic innovation. Is the United States more innovative today, now that it’s much more open to the rest of the world? It is even doubtful whether the east-west flow of ideas explains the rise of the European world to global dominance between 1500 and 1900—the main theme of Diamond’s book. This rise to dominance was fueled by a technological revolution that occurred largely in northwestern Europe, with the exception of only two major innovations of non-European origin: gunpowder and the printing press. Before 1500, Europeans did borrow considerably from the Middle East in such fields as chemistry, mathematics, and engineering, but this was a time of slow economic growth and geopolitical weakness. Europe took off economically and geopolitically only when it developed its own intellectual resources. So Stephen Jay Gould was wrong, and Samuel George Morton was right. Brain size does vary among human populations. But what does this variation mean? Why does it exist? For more information, the reader is referred to an earlier study: Beals, Smith, and Dodd (1984). The latter plotted cranial capacity from 122 human populations. The resulting map is shown above. A few caveats: there is a LOT of interpolation and extrapolation in the above map. There are no data points from Cambodia or southern Vietnam, and hence nothing to justify the very low values assigned to that region. Southern India is assigned a very low cranial capacity on the basis of a small sample that includes Veddas—a relic group of hunter-gatherers from Sri Lanka. All in all, and keeping these caveats in mind, cranial capacity does seem to correlate with latitude. Why? According to the authors, heads are larger at higher latitudes to reduce heat loss. An object will lose less heat if its ratio of volume to surface area is high. There has thus been natural selection to make heads broader and more globular at higher latitudes. The increase in brain size is incidental. This explanation was challenged in the comments section following the Beals, Smith, and Dodd (1984) article. 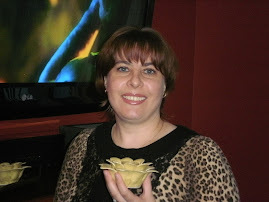 A Japanese commenter, Iwatoro Morimoto, pointed out that "in recent centuries, brachycranic skulls show a considerable increase in frequency in Eurasian populations, including the Japanese." Since mean temperatures have changed little in recent centuries, there must have been another factor at work. Unfortunately, Morimoto provided no references to back up this counter-argument. A recent analysis has nonetheless found a significant correlation between cranial capacity and latitude among ancestral hominids in general, ranging from A. Afarensis to H. sapiens (Henneberg and Miguel, 2004). The correlation remained even when the authors controlled for each skull’s time period and, thus, was not due to the overall rise in cranial capacity over time and the parallel expansion of ancestral hominids into higher latitudes. In sum, cranial capacity does correlate with latitude. It is less clear, however, whether this correlation is mediated by mean temperature and the need to reduce heat loss. Higher cognitive demands at higher latitudes? Could it be that cognitive demands increased as ancestral humans entered higher latitudes? Not because mean temperatures were lower but because the yearly cycle presented a greater diversity of environments and required much more foresight. Between ‘summer’ and ‘winter,’ the differences are much greater in the temperate and arctic zones than in the tropics. This point is elaborated upon by Hoffecker (2002, p. 135). Among early modern humans, tools and weapons were more complex at arctic latitudes than at tropical latitudes. “Technological complexity in colder environments seems to reflect the need for greater foraging efficiency in settings where many resources are available only for limited periods of time.” Arctic humans coped with resource fluctuations and high mobility requirements by planning ahead and by developing untended devices (e.g., traps and snares) and means of food storage. In addition, these increased cognitive demands fell on both men and women. Paternal and maternal investment were much more equal than in the tropics, where women provided for their families year-round with less male assistance (Kelly, 1995, pp. 268-269; Martin, 1974, pp. 16-18). Indeed, because men were the main food providers beyond the tropical zone, women could care for their families by developing a new range of tasks: food processing (e.g., butchery and carcass transport); shelter building; garment making; leather working; transport of material goods; etc. (Waguespack, 2005). This technological revolution would ultimately lead to what we now call ‘civilization’ (Frost, 2008). White racists like to make a big deal about the supposed correlation between head size and intelligence and race. A nice little chart showing the basically dishonest portrayal they attempt based on cherry-picking data is below. Methinks that Lindsay takes the fine details on that map a bit too seriously. Many of the details are simply creative extrapolation and infilling; otherwise, the map roughly corresponds with world distribution of mean IQ. Furthermore, no one is claiming that cranial capacity is the only determinant of IQ. There are undoubtedly many others: cortical surface area, myelinization of nerve fibers, relative importance of domain-general thinking, etc. But he does make a good point about the Amerindian data. As you can see, in the Americas, there is no good evidence whatsoever for head size and IQ. I am not aware that Amerindian IQ varies in the Americas. The average is apparently 87 across the continent. If anyone can show me that it varies by latitude, please do. Agreed. No one can, for now. But a hypothesis is not false because no one has bothered to test it. Frost, P. (2008). The path to civilization? Evo and Proud, March 10, 2008. Kelly, R.L. (1955). The Foraging Spectrum. Diversity in Hunter-Gatherer Lifeways. Washington: Smithsonian Institution Press. 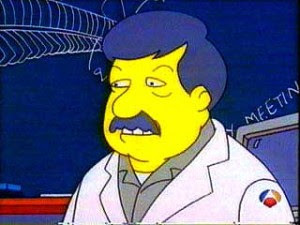 Stephen Jay Gould in a 1997 Simpsons episode (Pagepulp). Gould enjoys an almost iconic status in American culture. Who was the greatest evolutionary scientist of recent times? Most people would answer “Stephen J. Gould,” at least on this side of the Atlantic. With the possible exception of L.L. Cavalli-Sforza, he was the one best known to non-biologists, partly because he wrote well but also because he said the sorts of things that people in the humanities and social sciences wished to hear. My anthropology department was no exception. When I presented my dissertation proposal, one committee member launched into a criticism that he supported with a quote from one of Gould’s works. I didn’t understand the relevance of the quote—other than the banal point that many scholars are unconscious liars. But it hit home among the other people present. And why not? When Gould died, in 2002, his reputation was unshakable. You might have disagreed with his conclusions, but his methodology seemed sound. This was particularly so with his 1978 Science paper on 19th-century physical anthropologist Samuel George Morton, which showed how a reputedly objective scientist had unconsciously fudged his data to make Europeans look larger-brained than sub-Saharan Africans. Lisa Simpson wants to stop a huge mall development from proceeding at "Sabertooth Ravine" because the ravine is a fossil site. As a compromise, the mall developers decide to let Lisa dig for fossils while they continue to build the mall. While digging, Lisa finds an almost human fossil. Almost, but not quite: in place of arms the fossil has wings. "It's an angel" declare the naive and religiously motivated townfolk. Lisa, who plays the scientific naturalist, will have none of it. She therefore enlists Gould to prove that the fossil is nothing of the sort. Gould claims that the DNA tests he performed proved inconclusive. The Simpsons episode raised a few eyebrows. Was Gould guilty of the sort of shenanigans he had accused others of doing? Yes indeed. A team of physical anthropologists recently located half of the skulls that Samuel George Morton had measured more than a century and a half ago. When they remeasured the skulls they found very few errors in Morton’s measurements. More to the point, the errors were distributed randomly. There was, in fact, a non-significant tendency to overestimate African skull size (Lewis et al., 2011). It is also doubtful whether Morton considered Africans to be less “evolved” than Europeans. His Crania Americana was published in 1839, long before the first attempts to apply evolutionary theory to human races. Morton was in fact a devout Christian who wished to find out whether different human populations were separate species resulting from multiple divine creations or a single species created but once. He had little if any interest in research on human intelligence, which anyhow was embryonic at the time. Needless to say, Gould never remeasured any of Morton’s skulls. His paper was at best a clumsy re-analysis of Morton’s published data. I say “at best” because Gould bolstered his argument by creating facts out of thin air. It is a wonder that he managed to get published in a first-tier journal like Science, which as a rule publishes only original data. There is another disturbing element in this affair. Many of the flaws in Gould’s paper had already been pointed out … twenty-three years ago (Michael, 1988). And they were pointed out in a first-tier journal (Current Anthropology). Yet that other paper was studiously ignored. 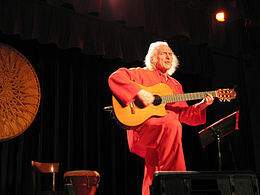 Gould owed his reputation not so much to the quality of his work as to an academic milieu that covered for him, acting more as cheerleaders than as responsible critics. He was shielded by a personality cult. Without it, he would have been just another biology professor. What now? Academia will likely enter a long and painful process of “de-Gouldization.” Long, because many other academics were in on the collective lying. Painful, because the lies were far from trivial. Dembski, W.A. (1997). An Analysis of Homer Simpson and Stephen Jay Gould, Access Research Network. Lewontin, R.C. (2008). The Triumph of Stephen Jay Gould, New York Review of Books, 55(2), 39-41, February 14, 2008.